"General of the Front 前将军 (qián jiāng jūn)"
Supposedly one of the top 5 generals of the Kingdom of Cao Wei 曹魏, Zhang Liao did not initially intend to follow under Cao Cao 曹操. In fact, Zhang Liao offered his neck for Cao Cao for beheading rather than choose to surrender. While Zhang Liao was serving Lu Bu 吕布, word had already went around of Zhang Liao's combat ability and his righteous character. Guan Yu 关羽 once asked him why he was serving for a man such as Lu Bu and Zhang Liao could only look down in shame. The two later became fast friends, though circumstances dictate they had to be enemies. Zhang Liao achieved renown under Cao Cao as a steadfast and competent general. 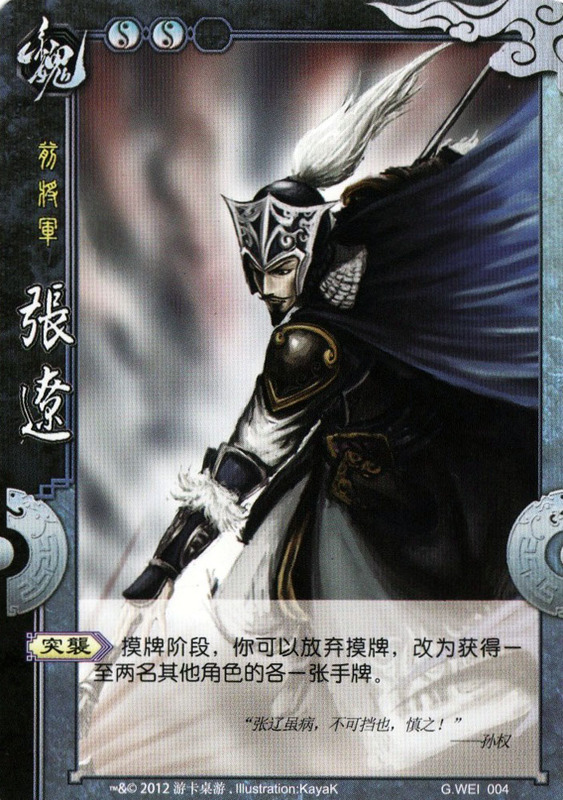 His title of "General of the Front" was given to him by Cao Pi 曹丕 after Cao Pi succeeded Cao Cao. Character ability: "Sudden Strike 突击 (tū jī)"
During your drawing phase, you can forfeit drawing cards from the deck. Instead, you acquire one on-hand card each from one to two other players. Minor description clarifications, but makes no difference to the usual way he is played. This part of the story occurs in the battle of He Fei 合肥之战 where Sun Quan 孙权, ruler of Sun Wu 孙吴, led a massive army to attack He Fei. Zhang Liao was one of 3 Cao Wei generals guarding He Fei, but they only had a combined army of 7000 men, many times less than the enemy. 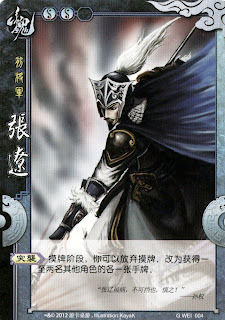 Leading the troops out, Zhang Liao bravely charged into the enemy and his combat prowess scared the balls off his enemy. Sun Quan's troops started deserting, not really knowing how large Zhang Liao's army was. Sun Quan climbed up a hill and saw that Zhang Liao was vastly outnumbered. He ordered his troops to encircle Zhang Liao. Unexpectedly, Zhang Liao suddenly charged out of the encirclement (thus the name "Sudden Strike") with a handful of troops and made straight for Sun Quan. The rest of Zhang Liao's troops cried out to him, "General! Have you abandoned us?!" Hearing this, Zhang Liao turned back and rescued his troops from certain death. Both parties grew weary and tired, thus they broke battle and headed back to camp.